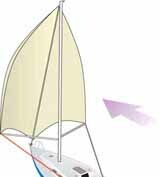 Most of us first start sailboat cruising as crew members on other people's sailboats. If we're lucky we go on to owning a sailboat of our own, eventually setting out on our first cruise as skipper. I can clearly remember - albeit a depressingly long time ago - my venture into the world of cruising as skipper of my own sailboat. It was a very tentative single-handed cruise from Poole Harbour to Lymington in my Etap 22, soon to be followed by a passage to Cowes on the Isle of Wight. And so I became the proud owner of a Nicholson 32 Mk 10, Jalingo 2, a proven offshore cruising boat that that came equipped with an Aries Windvane and was destined to take me far. Now the delightful Devon harbours and anchorages further west were within my cruising range - Lulworth Cove, Weymouth, Exmouth, Dartmouth, Salcombe, Plymouth and the iconic Cornish harbours of Fowey and Falmouth. Foreign cruising soon beckoned - well, across to France anyway. This was 'proper' passage making, with tides that go up and down 20 feet twice a day, and sideways at 5knots together with nose-to-tail shipping in the English Channel and fog, rain and south-westerly gales thrown in to keep you on your toes. Small boat cruising in these waters is buttock clenching stuff. If you can sail across the English Channel to France and back safely a few times you can sail anywhere, I reckon. But I paint a bleak picture; it's great sailing. Everyone should try it! 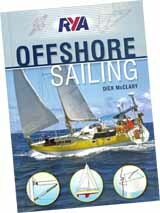 At this point I must mention a young reader who pointed out that I should say something on the vitally important subject of boating safety, and sent me this link 'Boating and Yacht Safety for All Age Levels'. Thank you Krista, there's some great safety advice there. Having served my cruising apprenticeship in my home waters, I ventured south to Spain, Portugal and Gibraltar, where I introduced my new partner, Mary, to the joys of cruising in the Mediterranean. Not the real tropical sailing we longed for, but a step in the right direction. In those days our navigation was done with a sextant, a towed Walker log and an RDF (Radio Direction Finder) - a far cry from the push-button approach that makes it all so easy today. Jalingo 2 was a tough, capable boat but no ocean greyhound. Great in strong winds, but rather under-canvassed when the wind dropped away. So with Jalingo2 back in the UK and up for sail, plans for a 38 foot light-displacement wood epoxy cutter were drawn up. After six years of boat-building graft, our new custom-designed sailboat Alacazam was launched at Plymouth's Tamar River Sailing Club. That's her at the top of this page, approaching Antigua and going lickety-split. No excuses now, loaded down with an extensive quantity of tools, spares, stores and equipment and with well-paid employment a distant memory, a tradewind crossing of the Atlantic Ocean beckoned. And so the pair of us began our live-aboard lifestyle and shortly after set out on our sailboat cruising adventure. France, Spain, Portugal, Madeira, Tenerife and then the big one - sailboat cruising across the Atlantic Ocean to the Caribbean. 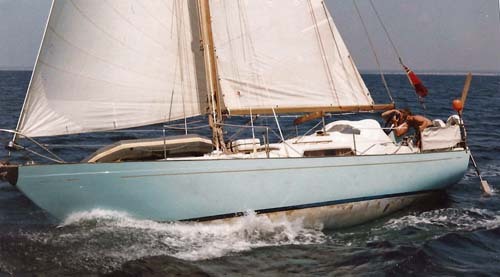 We set the traditional 'tradewind rig' with twin headsails set on the forestay, one sheeted through the end of the spinnaker pole and the other through a block shackled to the end of the squared-off boom, with the windvane self-steering gear keeping us on course for the whole 3,000 nautical miles. But it was a rolly passage in the following seas - going aloft would not have been much fun. We stuck religiously to our two-man watchkeeping rota. As a keen fisherman, the trolling lines were set on my watch and the catch cooked on Mary's watch. After 18 days at sea we arrived at Guadeloupe in the West Indies, and began cruising amongst the islands of the Caribbean Sea. The islands are a day's sail apart, so night sailing can be avoided if you prefer. The stress of boat handling in marinas can be avoided altogether, as there's no need to use them at all, providing you've got the right size and type of anchor and your anchoring technique is up to scratch. You can just drop anchor for free in one of the many delightful bays on the leeward side of the islands. Although many cruisers sit out the Caribbean hurricane season in one of the relatively safe hurricane holes, we prefer to haul out from June to November and return to the UK to recharge the cruising kitty. Do we prefer sailing in the tropics to sailboat cruising back home? You bet!